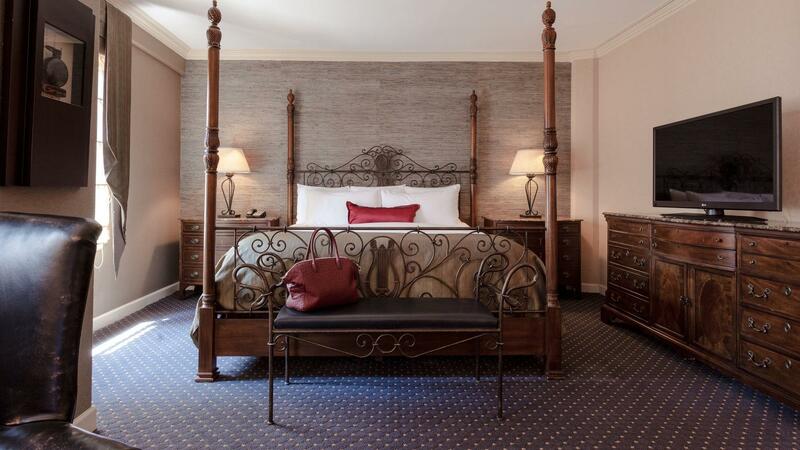 Enter a tasteful triumph in our hotel rooms in Chicago, Il. Our luxuriously appointed and spacious Junior Suite Room features a sitting area with a full-size sleeper sofa, allowing this room to sleep up to four guests. Enjoy a four-poster king-size bed, premium Egyptian cotton linens, white silk duvet cover over goose down comforter, exclusive Hypnos cashmere mattresses, restored antique mahogany furniture and writing desk designed with comfort and style in mind, original three-dimensional artwork, Whitehall signature plush robes, mini-bar, in-room safe, 42-inch high definition LED television, premium TV channels and cordless phone, marble bathrooms with hand-placed onyx mosaic tiles with a shower and soaking tub, as well as vanity and luxury bath amenities.